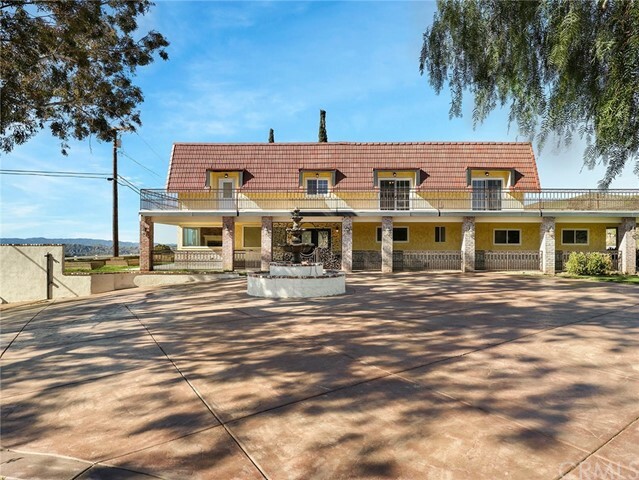 Magnificent home with guest house and over 4 acres of land in Agua Dulce! Enter into the gated home and park on the grand round stone driveway. As you walk into the home, be greeted with a living area which includes a vintage brick fireplace. Kitchen is huge with granite tile counters, white cabinets, stainless steel double ovens, Viking stove top, and large walk in pantry. Home has a light and airy feel with tons of windows and French doors letting natural lights to enter. Downstairs accommodates a large master bedroom with large master bathroom, including a jetted tub and resort style tile walk in shower. There’s a separate spacious living space with a second tile fire place. Upstairs contains four remaining bedrooms. Three of the upstairs bedrooms have access to a huge balcony overlooking the yard and valley. Beautiful wood flooring and white crown molding is flowing through the home. All bathrooms are upgraded with tile flooring and newer vanities. A stunning chandelier hangs over the stair way. Out back is a sparkly gated pool with a rock water fall feature that overlooks the gorgeous views of Agua Dulce. Front yard has AstroTurf and large wrap around porch surrounding the property. This home feels like a safe haven with views of green mountains and plants. Further, there is a guest house which contains a full bathroom, laundry area, upgraded cozy kitchen and living room, plus a room upstairs. A large shed is out back for storage. OWNED SOLAR! This is a must see!